One of the most remarkable creatures known to science is a miniscule, and some would even say "cute," aquatic creature with a snub nose and four pairs of legs - the tardigrade. These little creatures - sometimes called water bears - are incredibly strong, incredibly resilient to environmental extremes, and virtually immortal, essentially making them the Incredible Hulk of animals. Technically considered a "micro-animal," these microscopic animals have been found in some of the harshest environments on earth. Everyday scientists are discovering more amazing facts about tardigrades, and only now are they beginning to understand what makes these little critters so incredible. One of the most incredible things about water bears is the implications that their biology might one day benefit humanity, making them one of science's hottest topics. Check out these astonishing facts about the amazing tardigrade. Though miniscule in size, tardigrades are so incredibly powerful and capable of adapting to harsh environments that they have been alive since the Cambrian period over 500 million years ago. This period is most known for being when the major animal groups appear in fossil record. It's also the period where organisms - specifically animals - exploded in population and diversified in a relatively short period of time. That means tardigrades have survived four mass extinctions, each of which reset the playing field for life on Earth: Cretaceous-tertiary (65 million years ago), Permian-triassic (250 million years ago), Devonian Extinction (365 million years ago), and Ordovician-silurian (440 million years ago). 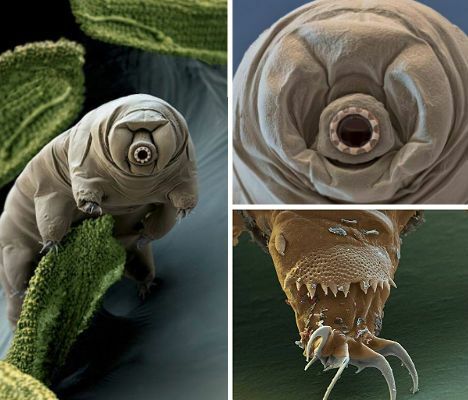 No living creature has survived the vacuum of space without protection - except the tardigrade. In 2007, thousands of tardigrades were exposed to the vacuum of space by the European Space Agency's FOTON-M3 robotic spacecraft. Their bodies were distorted by the lack of pressure, frozen solid, and blasted with massive amounts of ionizing solar and galactic cosmic radiation. Upon returning to Earth, scientists attempted to revive the desiccated tardigrades and an amazing 68% of them sprang back to life. Many of the tardigrades even laid eggs in space, and those were viable back on Earth. This made the tardigrade the first living animal to survive in space, and one of the few organisms on the planet to do so. Because of their longevity as a species, and their ability to survive in just about every environment on Earth - from the depths of the oceans to the heights of the Himalayas, from hot springs to glacier ice flows - and even in the vacuum of space, some have speculated that tardigrades might actually be extraterrestrial in origin, deposited on Earth by meteors or comets in a process called panspermia. There are over 1,000 known species of tardigrades, all of which share the same basic morphology. They are invertebrates measuring between .05 and 1.5 millimeters long. Their bodies are divided into five segments - four of which contain two pairs of legs each for anchoring to the ground and limited locomotion - and a fifth that is a cephalic, or head, containing a tube-shaped mouth loaded with internal "stilettos" they use to puncture plants to absorb nutrients or to eat other microorganisms whole. The tardigrades "sucker" and sharp teeth actually penetrate an organisms' cells, and drinks out all the nutrients inside. Some species of tardigrades are exclusively carnivores, some omnivores, but most are a combination of the two. These guys have been known to eat bacteria for food as well.